China is actively campaigning for a low-carbon footprint: Chinese company WinSun has managed to developed 3D printing techniques to construct buildings from recovered waste materials. As the biggest construction power in the world today, China is actively campaigning for a low-carbon footprint in its building projects, in keeping with domestic environmental protection laws that emphasize the ecological responsibilities of companies. The Shanghai WinSun Decoration Design Engineering Co is one example of a Chinese company that is tackling sustainability issues. WinSun has recently used 3D printing techniques and recovered waste materials to construct both the buildings and interior decor of two villas, among other projects. One of the villas was based on the design of the Classical Gardens of Suzhou, a well-known example of Chinese architecture. Normally, it would take more than a dozen workers to build a traditional Chinese style compound. One month ago, Mr. Ma Yihe, CEO of Shanghai WinSun Decoration Design Engineering Co, a pioneer in the 3D-printing of houses, led a team of three workers and finished printing all the components, assembly and interior decorations within a week. 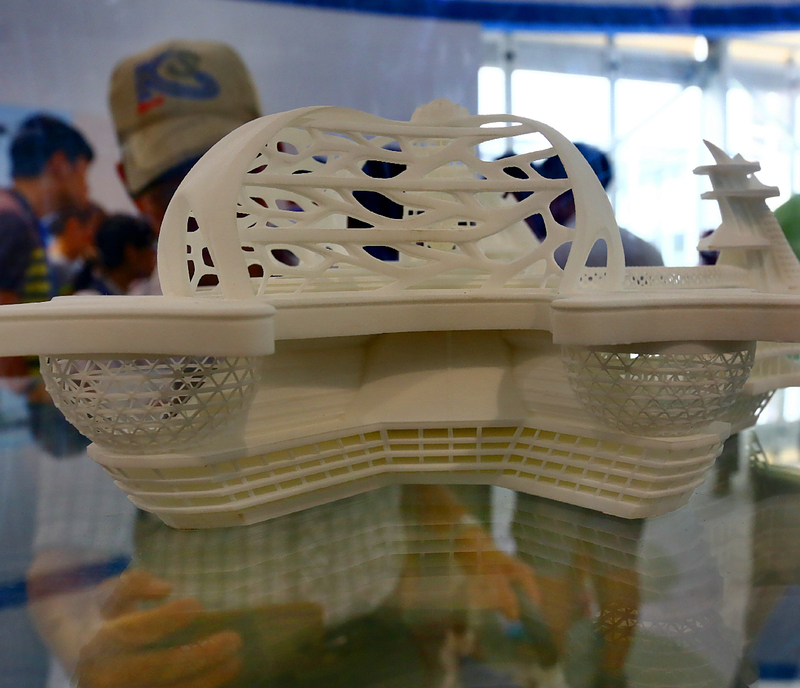 WinSun is the world’s first high-tech company to build houses through 3D printing. The construction materials he uses, which serve as the ‘ink’ for the printer, are mainly building and industrial waste from mills. They ensure the rigidity and strength of materials and help to recycle massive construction waste. The method also makes financial sense, 3D printing technology can help save 30 to 60 percent on building materials and 50 to 80 percent in labor costs. Two years ago, the company printed out 10 single-story houses in Shanghai’s Hi-Tech Industrial Park in under a day using giant printers measuring 32 meters long by 10 meters wide and nearly seven meters tall. WinSun is hoping that in future, the technique will be used in locations around the world as a means of providing cheap and efficient homes for low-income families. The process of erecting the houses involved adding materials layer by layer. Aimed at the luxury market, the villa which is on display at Suzhou Industrial Park in Jiangsu province covers 1,100 square meters and cost just over 1 million yuan to print. Although the government has not introduced any standards for 3D printed buildings yet, the company follows existing standards and such buildings are just as safe as ordinary residences, Mr. Ma said. Furthermore, carbon emissions from transportation, construction dust and noise are also reduced in on-site 3D printing, which is good news for the environment. The building sector worldwide currently accounts for 30 percent of total global annual greenhouse gas emissions, according to the UNEP Sustainable Buildings and Climate Initiative. 3D printing can substantially reduce traces of carbon emissions generated by the manufacturing industry, thereby providing an ideal remedy for our disaster-prone planet, according to a meteorological observatory expert. The company said it has established a joint venture with a US partner and plans to establish factories in countries such as Saudi Arabia, the United Arab Emirates, Qatar, Morocco, Tunisia and the United States within three years. Recently, the company signed a cooperation agreement with Hyperloop Transportation Technologies, a high-speed rail company, to 3D print high-strength, high-precision pipelines, stations and platforms for their ‘super-speed’ rail project. This is an innovative mode of transportation that allows passengers to travel at a maximum speed of 1,200 kilometers an hour.